Do you have lots of wood to split, and are looking for the right tools to help you make the task so much more relaxed? Do you prefer splitting wood manually so that you get a good workout while cutting wood? If yes, then the best Wood Splitting Wedge seems to be ideal for your work specifications. You can find out how and why after reading the following Collins Wood Splitting Wedge review. 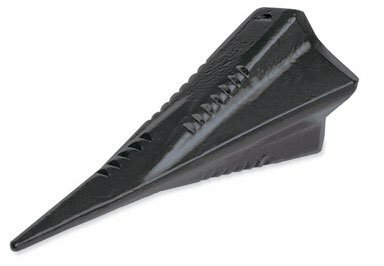 This is a black diamond-shaped splitting wedge that is also called a grenade. It weighs about 4 pounds and splits wood in numerous directions when hit by an axe or sledgehammer. The splitting wedge is made using heat treated high carbon steel and reaches you boxed. The wood chopping wedge even has some teeth on its sides that give it a better grip. This minimizes the chances of the wedge moving around while cutting wood. And as the wedge is small in size and light in weight, it can be carried and used wherever you choose. What is the wedge made of? Where is the wedge manufactured? What tool should be used with this manual log splitter? What makes the Collins Wood Splitting wedge unique is that it’s perfect and easy even for homeowners to use. There are no complex parts of mechanisms to use and it’s lightweight at only four pounds. And unlike traditional wedges that split wood in only two directions, it cuts each piece of wood in multiple pieces once hit. As the wedge cuts wood into various pieces when you hit it with this wedge, your wood splitting chore is completed at a much faster pace. It can be used to effectively split all types of firewood, including hardwood. The diamond splitting wedge is made using high treated high carbon steel for extra durability and strength. It’s much better than older, traditional wedges as it splits firewood in multiple directions and not two directions. Another advantage of the design of this splitting wedge is it’s large head. It makes a much easier target to hit when compared to the narrow-headed wedges. The Collins Wood Splitting Wedge is manufactured by Truper Garden Tool. Its unique diamond shape helps it split wood in multiple directions. It’s also called a wood grenade as its four ridges create splits in 4 directions. This is in contrast to the usual, flat wedges that split wood in just two directions. The diamond splitting wedge is made using heat treated high carbon steel for extra durability and strength. It’s much better than older, traditional wedges as it splits firewood in multiple directions and not two directions. All you need to do is hold the wedge onto the wood to be split and hit it with an axe, hammer or sledgehammer. In most cases, all it takes is a single strike to cut wood. A strong feature about this diamond splitting wedge is the fact that it sides come with a teethed design. This is to ensure the wedge gets a strong grip while splitting wood, and there is no chance of it shaking while you chop your wood. This is unlike other wedges that tend to bounce out after hit by a few axe swings. A strong and durable metal, heat treated high carbon steel. It is manufactured in China by Truper Garden Tool. You need an axe, hammer or sledgehammer for striking and splitting wood. With this Collins Wood Splitting Wedge review, you can make out that this is a wood splitting tools wedge worth investing. A single hit is all that’s usually needed for it to split wood into four directions. It’s serrated edges give a better grip to prevent bouncing off while cutting wood while it’s large head makes it an easier target to hit with an axe or sledgehammer. So the diamond-shaped grenade wedge helps you complete your wood splitting and cutting tasks with so much less time and effort. And as it’s a manual wedge, you don’t need any fuel or power point to use it. It also means you can carry and use it wherever you go, and whenever you want.